Richard John Kerry was born on 28 July 1915 at Brookline, Norfolk Co., MA. He married Rosemary Isabel Forbes, daughter of James Grant Forbes and Margaret Tyndal Winthrop, on 8 February 1941 at Montgomery, Montgomery Co., AL. Richard John Kerry died on 29 July 2000 at Massachusetts General Hospital, Boston, Suffolk Co., MA, at age 85. [S820] Scott C. Steward and Chip Rowe, Robert Winthrop, page 276. [S820] Scott C. Steward and Chip Rowe, Robert Winthrop, page 272. Francis Blackwell Forbes was born on 11 August 1839. He married Isabel Clark, daughter of William Mather Clark and Isabella Staples, on 8 May 1867 at New York, NY. Francis Blackwell Forbes died on 2 May 1908 at Boston, Suffolk Co., MA, at age 68. Isabel Clark was born in July 1846 at NY. She was the daughter of William Mather Clark and Isabella Staples. Isabel Clark married Francis Blackwell Forbes on 8 May 1867 at New York, NY. Isabel Clark died on 1 September 1931 at Boston, Suffolk Co., MA, at age 85. William Mather Clark was born on 26 May 1805 at Litchfield, Litchfield Co., CT. He was the son of Stephen Clark and Roxanna Phelps. William Mather Clark married Isabella Staples. William Mather Clark died on 21 November 1878 at New York, New York Co., NY, at age 73. Isabella Staples married William Mather Clark, son of Stephen Clark and Roxanna Phelps. Stephen Clark was born circa 1775 at CT. He married Roxanna Phelps on 6 October 1802 at Litchfield, Litchfield Co., CT. Stephen Clark died on 18 September 1828. Roxanna Phelps was born circa 1764. She married Stephen Clark on 6 October 1802 at Litchfield, Litchfield Co., CT. Roxanna Phelps died on 19 January 1837 at Litchfield, Litchfield Co., CT.
Lucy Stevens was born circa 1717 at Stonington, New London Co., CT. She was the daughter of Henry Stevens Jr. and Elizabeth Fellows.1 Lucy Stevens married Ephraim Smith on 3 January 1743/44 at Stonington, New London Co., CT.2 Lucy Stevens died on 4 May 1806 at Pottstown, Montgomery Co., PA.
King George Windsor V was born in 1865. He died in 1936. [S546] Hillyer G. Norment, John Hillyer, Page 185. John Parks was born on 30 April 1798 at Harrison Co., OH. He married Beulah Messenger, daughter of Elijah Messenger and Lucretia Matson, on 23 November 1820 at Harrison Co., OH. John Parks died on 25 August 1844 at Perry Township, Tuscarawas Co., OH, at age 46. He was buried at Perry Cemetery, Tuscarawas Co., OH. Beulah was enumerated in the 1850 Perry, Tuscarawas Co., OH, federal census. She was 53. Children in the household were Caroline 19, Bulah A. 17, Wesley 16, Elizabeth L. 15, Rebecca M. 15, Laban 12., and Sarah L. 4. Beulah was enumerated in the 1860 Perry, Tuscarawas Co., OH, federal census. She was a farmer, age 62. Children in the household were Wesley 26, Lucinda 24, Matilda 24, Sarah L 14, and John W. 10. Beulah Messenger was born on 5 March 1798 at CT. She was the daughter of Elijah Messenger and Lucretia Matson. Beulah Messenger married John Parks on 23 November 1820 at Harrison Co., OH. Beulah Messenger died on 27 August 1884 at Lincoln Co., KS, at age 86, and was buried at Sunnyside Cemetery, Lincoln Co., KS. Mrs. Beula [sic] Parks fell asleep in Jesus at the home of her daughter, Mrs. Josephus Baker, in Lincoln county, Kan., on Aug. 27, 1884. She had lived 86 years, 6 months and 18 days. She was born in Simsbury, Conn. Sixty years of her life she spent in Ohio. Here in Kansas she found herself among her children and grandchildren. She joined the church at the age of 18, her trust in his savior made her life very cheerful and her death a triumph. Rev. E. Bradbury conducted the funeral services at Sunnyside. John Madison Parks was born on 23 August 1821 at Harrison Co., OH.1 He was the son of John Parks and Beulah Messenger. John Madison Parks married Mary Milliken on 13 December 1847 at Tuscarawas Co., OH. John Madison Parks married Lucinda Isophene Treakle on 1 September 1867 at Tuscarawas Co., OH. John Madison Parks died in 1909 at KS. John M. and Mary were enumerated in the 1850 Perry, Tuscarawas Co., OH, federal census. He was a farmer, age 29, she was 24. The only child in the household was Matilda C. 1. John M. and Mary were enumerated in the 1860 Perry, Tuscarawas Co., OH, federal census. He was a farmer, age 38, she was 32. Children in the household were Matilda C. 10, John M. 7, Nancy A. 5, Mary E. 2, and Samuel T. 2 months. He was buried at Oswego City Cemetery, Labette Co, KS. Robert Finley Parks was born in 1822 at Harrison Co., OH. He was the son of John Parks and Beulah Messenger. George Washington Parks married Mary Carpenter. George Washington Parks was born in 1824 at Harrison Co., OH. He was the son of John Parks and Beulah Messenger. George Washington Parks married Mary Ann Millikin on 6 June 1847. George Washington Parks died in 1854 at Astoria, Fulton Co., IL. George and Mary A. were enumerated in the 1850 Rush, Tuscarawas Co., OH, federal census. He was a farmer, age 25, she was 20. Children in the household were James M. 1, and John W. 8 months. William Harrison Parks was born on 1 March 1825 at Harrison Co., OH. He was the son of John Parks and Beulah Messenger. William Harrison Parks married Mary Ann Wilson on 6 July 1851 at Tuscarawas Co., OH. William Harrison Parks married Sarah Ann Brink on 17 April 1870 at Fulton Co., IL. William Harrison Parks died on 7 January 1909 at Marietta, Fulton Co., IL, at age 83. He was buried at Marietta Cemetery, Fulton Co., IL. William H. and Polly a. were enumerated in the 1860 Perry, Tuscarawas Co., OH, federal census. He was a Farm Laborer, age 35, she was 38. Children in the household were Robert F. 7, and James D. 5. William and Sarah A. were enumerated in the 1880 Harris, Fulton Co., IL, federal census. He was a farmer, age 55, she was 47. The only child in the household was Mary Luella, 8. Mary Emeline Parks was born in October 1826 at Harrison Co., OH. She was the daughter of John Parks and Beulah Messenger. Mary Emeline Parks married John Norman Steele on 11 March 1847 at Tuscarawas Co., OH. Mary Emeline Parks died in March 1902 at Denver, Denver Co., CO, at age 75. She was buried at Riverside Cemetery, Denver Co., CO.
Mary Steel was enumerated in the 1860 Astoria, Fulton Co., IL, federal census. She was a seamstress, 33. Children in the household were Mary L. 12. Amelia 11, James 9, emily 5, Lucinda 3, and Sarah 3 months. Mary was enumerated in the 1870 Astoria, Fulton Co., IL, federal census. She was 43. Children in the household were Nellie 21, James 19, Emma 16, Lucinda 13, and Sallie 10. 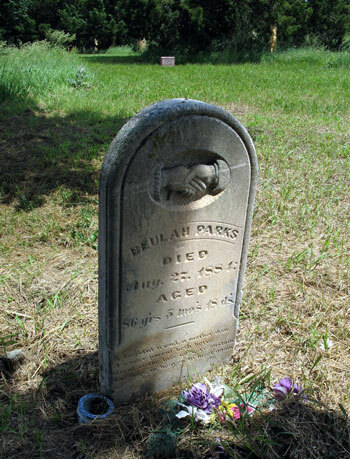 Beulah Ann Parks was born in 1828 at Perry Township, Tuscarawas Co., OH. She was the daughter of John Parks and Beulah Messenger. Beulah Ann Parks married Samuel N. Clifford in 1850 at OH. It is probably this Samuel and Beulah enumerated in the 1860 Cadiz, Harison Co., OH, federal census. He was a farmer, age 37, she was 28. The children, listed in the original order were Oscar 2, Lawrence 1, Melinda 12, George 10, and Louisa 6. From this order you could question if Samuel had an earlier marriage or if the last three children were from another Clifford family. Also enumerated was Nancy Clifford, 73. [S182] Social Security Death Index (on-line), Ancestry.com, SSDI, Ancestry.com, SSAN 510-26-2390. Caroline Parks married Summerfield Shaw. Caroline Parks married ? Dicks. Caroline Parks was born in 1830 at Perry Township, Tuscarawas Co., OH. She was the daughter of John Parks and Beulah Messenger. Wesley Parks was born in August 1833 at Perry Township, Tuscarawas Co., OH.1 He was the son of John Parks and Beulah Messenger. Wesley Parks married Elizabeth Alexander. Wesley and Elizabeth were enumerated in the 1870 Rush, Tuscarawas Co., OH, federal census. He was a farmer, age 30, she was 28. Children in the household were Matilda 12, John 9, and Lewis 3. Westley and Eliza A. were enumerated in the 1880 Mill, Tuscarawas Co., OH, federal census. He was a farmer age 45, she was 38. Chilcren in the household were Matilda 18, John A. 16, Lewis 12, William O. 4, and Adella B. 8 months. Widower Wesley was enumerated in the 1900 Goshen, Tuscarawas Co., OH, federal census. He was a boarder in the household of Curtis Keffer. He was 66. Rebecca Matilda Parks was born on 22 February 1835 at Perry Township, Tuscarawas Co., OH. She was the daughter of John Parks and Beulah Messenger. Rebecca Matilda Parks married Joseph Baker at Lincoln Co., KS. Rebecca Matilda Parks died on 7 June 1916 at Gentry, Benton Co., AR, at age 81. Elizabeth Lucinda Parks was born on 22 February 1835 at Perry Township, Tuscarawas Co., OH. She was the daughter of John Parks and Beulah Messenger. Elizabeth Lucinda Parks married Robert Wilson. Elizabeth Lucinda Parks died on 23 December 1910 at Red Cloud, Webster Co, NE, at age 75. Laban Parks was born on 28 March 1838 at Perry Township, Tuscarawas Co., OH. He was the son of John Parks and Beulah Messenger. Laban Parks married Rachael Ann Grewell. Laban Parks died on 3 February 1920 at age 81. Laban and Rachel were enumerated in the 1870 Swan City, Saline Co., NE, federal census. He was a farmer, age 32, she was 27. Children in the household were Annie 8, Grant 7, Philip 4, and Arthur 2. Layman and Rachel A. were enumerated in the 1880 Fort Collins, Larimer Co., CO, federal census. He was 42, she was 35. Children in the household were Anna 18, Grant 16, Philip 14, Arthur 12, Eva Bell 9, Leverne 5, and Cassius 1. Laban and Rachel A. were enumerated in the 1900 Southeast Loveland, Larimer Co., CO, federal census. He was a farmer, age 62, she was 58; they had been married 40 years and 7 of their 8 children still survived. Children in the household were LaVerne 23, L Cassius 21, and Daniel V. 17. Laban and Rachel were enumerated in the 1910 Pocatello, Bannock Co., ID, federal census. He was 72, she was 69. children in the household were Grant 46, and Danie 27. Laban S. and Rachel L. were enumerated in the 1920 Pocatello, Bannock Co., ID, federal census. He was 81, she was 78. Children in the household were Bamford G. 56, and Daniel V. 36. Infant Parks died in 1840. He was born in 1840 at Perry Township, Tuscarawas Co., OH. He was the son of John Parks and Beulah Messenger. James Parks died in 1840 at Perry Township, Tuscarawas Co., OH. He was born in 1840 at Perry Township, Tuscarawas Co., OH. He was the son of John Parks and Beulah Messenger. Wanser and Sophronia were enumerated in the 1870 Ravenna, Portage Co., OH, federal census. He was a Stone Mason, age 42; she was 41. Children in the household were William 16, a jewelers apprentice, and Harry, 5. Wanser and Sophrona C. were enumerated in the 1880 Ravenna, Portage Co., OH, federal census. He was a Glass Manufacturer, age 52, she was 50. The only child in the household ws Harry S. 16. WANZER HOLCOMB, capitalist, Ravenna, was born September 9, 1827, in this county, son of William A. Holcomb. He received his education in the schools of the home district and at Marlboro Academy, Stark Co., Ohio. In early life he learned the trade of stone and brick mason with his father. On September 25, 1851, he was married to Miss Sophronia C. Stough, of Ravenna, daughter of the well known pioneer, Jacob Stough, and was brought up in this city. Their children are Margaret (now Mrs. Smith), William W. and Harry S. After living in Edinburg two years and in Mount Pleasant, Iowa, five years our subject and family finally settled in Ravenna. Mr. Holcomb was appointed in 1857 Superintendent of Masonry on the A.&G.W. (now the N.Y.,P.&O.) R.R., which position he held until 1868. Since that time he has been engaged as contractor, taking extensive contracts for corporations and railroad companies. Since 1870 he has been connected with the Diamond Glass Works of this city, and now owns a one-half interest in the concern. Mr. Holcomb is a member of the Disciples Church. He is a life-long Republican. [S182] Social Security Death Index (on-line), Ancestry.com, SSDI, Ancestry.com, SSAN 049-10-2760. [S182] Social Security Death Index (on-line), Ancestry.com, SSDI, Ancestry.com, SSAN 105-36-2295. [S182] Social Security Death Index (on-line), Ancestry.com, SSDI, Ancestry.com, SSAN 072-24-3040. [S182] Social Security Death Index (on-line), Ancestry.com, SSDI, Ancestry.com, SSAN 084-09-7862. [S182] Social Security Death Index (on-line), Ancestry.com, SSDI, Ancestry.com, SSAN 094-01-9955.